The Annapolis Irish Festival Exhibition Piping Contest “The Clover Crown” brought together the bagpipe virtuosos of our region in a contest to see who is the best at conveying the beauty and excitement of traditional Irish and inter-Celtic music to the general public. 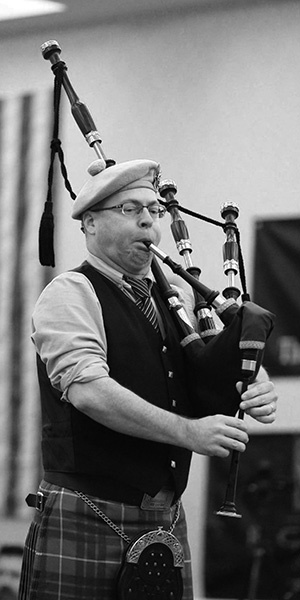 The contest was judged by local piping star Robert Mitchell and the top prizes awarded to the players who use their lifetimes of study to entertain the audience who may never have heard traditional music before. The players announced by members of the AIF entertainment lineup including Seamus Kennedy and piper EJ Jones. This contest was primarily focused on pipers not just competing, but especially playing to the audience. There were two events consisting of 3-8 minute medleys: an Irish traditional music event, and inter-Celtic Freestyle event. Since each competitor must be ranked officially Professional or Grade I, their “classical” credentials have been established and their performances will be judged primarily on how they seduce the audience using only a Great Highland Bagpipe. A wee lad of three at a parade with his parents the first time he heard the sounds of a pipe band in his hometown of Ballygowan, Northern Ireland, Andrew Carlisle started taking piping lessons when he was seven. Never dreaming it possible to make a living with music, Andrew, now 32, is Professor of Music and Director of Piping at Carnegie Mellon University in Pittsburgh, PA. The hardest thing about learning “the most temperamental instrument in the world” was the tricky transition from the practice chanter to handling the full bagpipe. Samuel Connolly and Jimmy McIntosh were among Andrew’s first teachers. And now, as a teacher himself, he loves being part of the chain keeping the tradition alive. Trad Celtic music and bands such as Bothy Band and The Chieftains are among his favorites, and Andrew has performed all over the world, including perennial favorite Festival Interceltique de Lorient. The roster of wins under his belt include The Gillies Cup for Premier Piobaireachd at London and The A Grade Strathspey and Reel at The Argyllshire Gathering, Oban. And if he had to choose between whiskey and rum, it’s whiskey, every time. Irish whiskey, naturally. Bushmills. An amazing bagpipe solo he heard once was a powerful first inspiration for Andrew, now 26, who hails from Washington, DC. “I was like, that’s really cool, I want to do that!” More inspiration came from a youth pipe band in Montgomery County, MD, and also from his dad, a drummer in the DC Fire Department Pipe Band. Andrew felt lucky growing up in the rich culture of piping and drumming in the DC and Baltimore area, in a youth piping band with other AIF Exhibition Contest competitors Nick Hudson and Ben McClamrock, and with early instruction from Chris Hamilton. Always hungering to improve, trying new things, or working on something from a different perspective is his best skill as both a competitor and piper; but consistency is his greatest weakness, he says. Piping accolades include winning the A grade jig at London in 2018, the Silver at Inverness in 2018, and US Silver in 2015, and Andrew has played in Spirit of Scotland Pipe Band. When he’s not piping, Andrew enjoys mountain biking and traveling…and speaking of chasing tunes, he’s planning on following the band Phish on their upcoming fall tour. After a long break to focus on family, education and work, Vic Frank, from Bowie, MD, and now in Silver Spring, is back in the piping saddle, albeit with slightly slower fingers. It’s less learning new tunes now and more “warding off the forces of decrepitude” with his piping, Vic, 55, says jokingly. Vic’s Marine dad, who loved Scottish military pipe band records like Black Watch and Scots Guards, got him interested in piping at the age of 7. 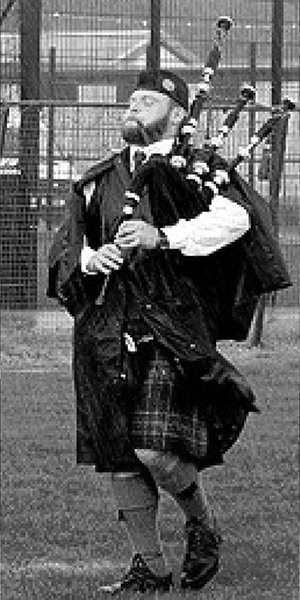 “And I was fortunate that there was a really good teacher nearby, Pipe Major Sandy Jones (of the US Air Force Pipe Band). Vic, loving the way it felt to play, began studying hard and has been competing since he was 8. 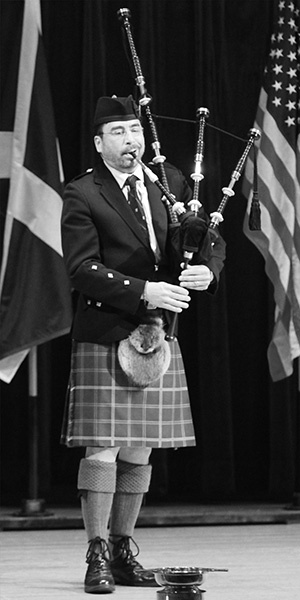 One recent win is the piobaireachd at the US Piping Foundation in 2014. Now, he’s “just trying to keep improving despite my ‘advanced’ years, and learning new music, trying to get my instrument better,” though oldies but goodies still hold interest, such as the “evergreens” Mrs. MacPherson of Invaren, and Lochanside. Chris, 56, now in Rockville, MD, but who grew up mainly in Pittsburgh, started playing those pipe band records and his reaction was immediate: “Oh my god, YES. This is what I must do.” Teachers, beginning with Joyce (MacFarlane) McIntosh, were found, and he enthusiastically began a lifelong love affair with the bagpipe. Sometimes, as a teen, though, boredom struck. “I just thought it would be all glorious and I’d have a great uniform, just like all the history books…the reality of course was much harder than I thought.” His mom actually had to pay him to practice when he was 13. “She said it didn’t cost her much money because I didn’t practice much,” Chris laughs. Although he’s quit piping twice for a few years at a time, Chris, who ran bagpipe shop Tone Czar for 10 years, taught piping, and has founded and served as Pipe Major for several bands, keeps coming back for more. “It’s a part of my life. You hear those pipes and you’re like, I was BORN to do this,” he says. And lastly, Chris answers what we’d all like to know about every piper: when out on the field, what’s he wearing? Boxers, briefs, or…regimental? Originally from Massachusetts, Nick got into piping as an 8th grader in Cleveland after being intrigued by the bagpipe for years; shortly after moving to Maryland, he joined the Rockville High School Pipe Band. “I had the hardest time learning how to march, blow steady, and remember the tune all at the same time,” Nick says. “There’s a lot of funny things (about the pipes) that are not intuitive, compared to other instruments,” but he had a blast getting to learn piping from great teachers with other kids his age. Now, holding a Music Performance degree from Carnegie Mellon University, Nick’s thankful to teach school band full-time at St. Thomas School, a K-12 school with a six-time World Champion bagpipe band. 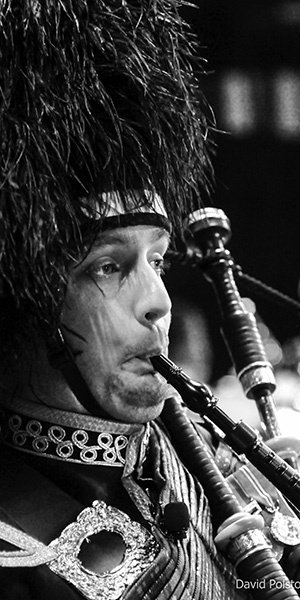 In addition to the Great Highland Bagpipe, Nick plays smallpipes, border pipes and whistles. He gravitates to piobaireachd and jigs because you get something to get your fingers moving and also something to slow down with and take in the sonorous quality of the instrument. Some of his favorite performances involve “playing complex, long-form bagpipe music in front of small audiences of aficionados at prestigious piping competitions with centuries-old history and tradition,” Nick says. He’s also enjoyed different and swankier gigs, such as playing for President Obama in The White House, for tens of thousands at NFL games, and as a guest musician with Grammy-winning acts such as The Chieftains and Carlos Núñez. Nick likes that the music he plays is “connected to a past and by doing it, you’re connecting yourself to these other people that came before you in an interesting way. But of course, it’s always evolving and changing, it’s not like a museum piece.” In addition to being lucky enough to perform and compete at Lorient’s Interceltique Festival, he travels regularly to Scotland, where he’s won the Braemar Gold Medal, Oban Silver Medal, Inverness. Although a bit older than most kids are when first bitten by the bagpiping bug—15—age didn’t matter for Dan Lyden, who hasn’t wavered in his devotion to the instrument. He’d tinkered with alto sax, trombone and tuba before that first time he heard a pipe band playing in Dundalk in a 4th of July parade, but Dan, now 35, says he has no interest in playing any other instrument again. Originally from Baltimore, MD, Dan now lives in Timonium. When he became interested in the pipes, his father found his first teacher, Ed Kitlowski, and he also joined a local pipe band. Now, Dan himself is a piping teacher and feels this is what he’s meant to do. Dan’s best skill? Teaching bands to play in unison and teaching pipers how to tune their pipes. And he’s known for his hornpipes and jigs. A favorite piobaireachd that makes him particularly happy is The Red Speckled Bull. Dan is also a several time EUSPBA (Eastern United States Pipe Band Association) season champion and has won the piobaireachd at Birnam. One important final thing to know about Dan: when it comes to peanut butter, he prefers crunchy over smooth. Tinton Falls, NJ, bred and born, Derek, 35, brings “Jersey flair to the Highlands idiom”—along with a strong competitive streak and a somewhat unique path to the pipes. It was his younger sister Morgan who’d wanted to try them and their mom said if she wanted to, then they both had to. 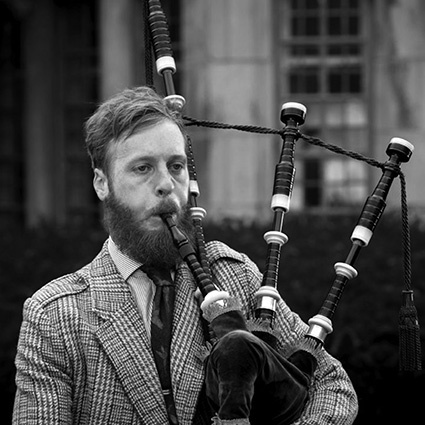 What continued to hold his interest in piping was that tangible confidence-building feeling akin to that of the “leveling up” one might experience when playing board games—which is another one of Derek’s passions, in addition to running and craft beers. Having specific and competitive piping goals keeps Derek focused. Right now he’s reaching for a gold medal. “Maybe it’s just the way I’m wired, but for me it’s the next thing, so therefore it needs to be done, as opposed to raw inspiration.” If he couldn’t play pipes, he’d find something else to enjoy being competitive in. Accolades already won include the Golden Axe at the Lochaber Gathering in 2017, Silver in 2012 at the Northern Gathering and the Dunvegan Medal at the 2016 Skye Gathering. 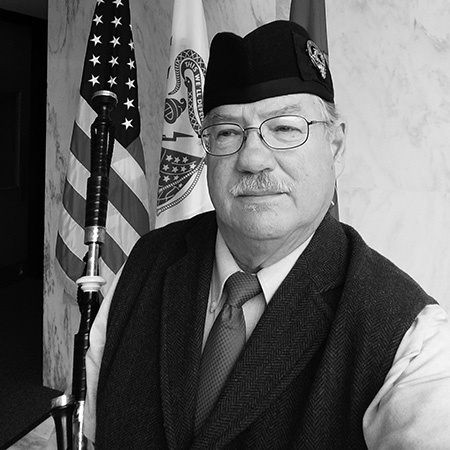 Bob, now 67 and living in Shepherdstown, WV, also began taking lessons together with his father in Wilmington, DE, from Robert Gilchrist, well known as a founder of the Eastern United States Pipe Band Association. 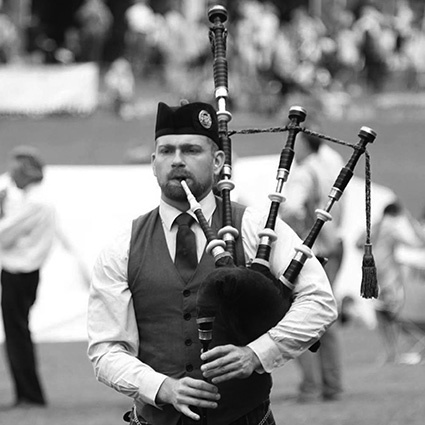 Interested in preserving and promoting bagpiping, Gilchrist helped grow interest and participation from just a few people to the thousands it is today, Bob says. Bob is really impressed with today’s strong group of pipers and says they’re unique, as they remind him of a specific, equally very talented group who were around Ontario when he was a senior in high school, that had also grown up competing against each other and taking turns winning prizes. And finally, because Bob dreams of traveling to one of the world’s bagpipe meccas, Ireland, here’s an important question: Aisle or window seat?